A solid effort by a new writer, this YA fantasy will probably appeal more to the younger readers, less familiar with (and less tired of) the young-man-on-a-quest tropes. It does take quite a while to get going, but finally hits the stride at about 50% mark, with some welcome action and interesting creatures being introduced. As most indie publications, it could have used a little more editing, although the errors are mostly typos that don't really detract from the experience. The characters are just well enough developed to hold our interest in their fate, and the magic is simple, more a tool for the characters to use in their adventures than something to dwell on. That leaves most of the literal and figurative space of the book to just enjoy the journey through the new world created by the author.This is a very earnest kind of fantasy, bringing up the issues of self-sacrifice, honor and loss. It can be enjoyed by adults who don't expect to cover drastically new ground, or could be an excellent intro to fantasy for teens. I really enjoyed this book. I would put it in the YA/Teen Fantasy category for difficulty and subject, but the author's voice was fun and enjoyable, and the story, while following some standard plot lines, was well written and unique in many ways. I appreciated the way the story was completed at the end of the book, but still left plenty of hooks for a sequel, or a longer series.I was a bit disappointed in the number of spelling/grammatical errors in the book, after I realized that it was not an uncorrected proof, but the actual published version... hopefully that can be addressed before any reprints.Barring that small nuisance, I was thoroughly pleased with the experience, and would not hesitate to pick up another book by Mr. Roach in the future. This book is an awesome read. The book is entertaining to the point that it keeps you hooked constantly, and the author makes sure he doesn't go over the top with it. This read is also hilarious by putting the hero in many different awkward situations, but also keeping the story on-track with a serious quest. In a final note, the magic of this world is very interesting in the way it is described and performed. A very good book, can't wait to see more! 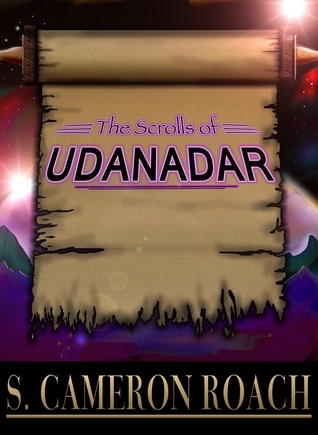 This is not the type of book I usually read, but I really enjoyed Scrolls of Udanar. S. Cameron Roach - S. Cameron Roach (1967-Present) is an award winning author born a U.S. Navy brat in VA and was soon moved to San Diego, CA where he finished growing up. In the process he became a suffering Chargers and Padres fan while also meeting his future wife; one has nothing to do with the other. Once married and realizing the terror of supporting a family, he joined the U.S. Army and begat two Army brats enroute to 24 years of service to his country in the Military Intelligence field; first as enlisted and later as a Warrant Officer. He has a BS in Intelligence (no really, I do! ), served in Desert Storm and both recent ventures in Iraq and Afghanistan. S. Cameron Roach is currently living in Texas with his lovely and dedicated wife of 25 years, Kelli, and two boxers. Now S. Cameron Roach is looking to begin the next stage of his life in retirement as an author bringing smiles, laughter, and adventure to avid readers.